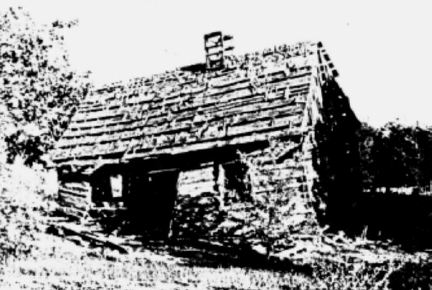 In 1861, Sarah and William Hasting and their three children settled in Grafton. They lived in a wagon box, cooked over a campfire and lived on caneseedbread, pigweed and sego lily roots. William bought a dugout from the Romney family (Hastings Dugout). It is now just a depression in ground behind the cabin pictured above. The lot is located on a corner across the street from the schoolhouse. The dugout was a room 12 by 14 feet, which was a hole dug in the ground and hill and walled up in front with two windows and a door. William died in 1882 at the age 58. Sarah lived there for over 50 years and moved from Grafton to Hurricane in 1915. She died in 1920 at the age of 90. This year we received a $7,500 matching grant from the Utah Division of State History through the Town of Rockville. The Partnership provided the match of $7500 for the grant. Funds were used to work on the interior of Russell Home and straighten the sagging porch, install new living room ceiling, replace and repaired wood baseboards in the living room and bedrooms. Painted some of window frames inside, installed two new fireplace mantels and fireplace hearth stones at the base, repointed the adobe to upstairs bedrooms and patched the adobe exterior walls. 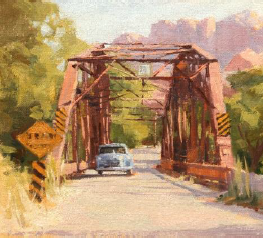 The Town of Rockville was successful at raising matching funds needed to restore the bridge. Fundraising efforts were led by Mayor Pam Leach, the Town Council and a Fundraising Committee. These efforts included Town budget allocations, rubber ducky races, art exhibitions and auctions, collection jars, the receipt of several grants and many other activities, which have netted a current fund of $70,000. Utah Representative Brad Last and Senator Evan Vickers, made a $100,000 request to the Utah State Legislature.It was granted, this funding would complete the matching funds of $169,250 needed from the Town. Everyone is invited to the annual Grafton Reunion, September 30, 2017 at Grafton from 11-2:00 P.M. Bring your lunch, hat, chair and memories to share. The Partnership will have items such as books, pictures of Grafton and t-shirts available. There will be a program and if you have any stories you would like to tell about Grafton, or a song to sing, call us (phone 435-635-2133). A Grafton Reunion Facebook page has been set up. 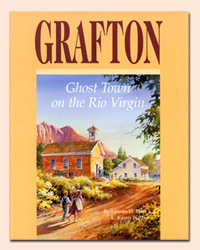 Where anyone can upload photos and histories at https://www.facebook.com/graftonutah It is also posted on our webpage. A special note of thanks to all that left us a donation at Grafton donation box. You can donate by mailing a check, or by using a credit card on our secure web page at www.graftonheritage.org. Just click on Support Us. Or remember us in your will.